A Palestinian assailant snuck into a home in a West Bank settlement Friday and stabbed three Israelis to death, the head of the country’s rescue services said. An Israeli news site said those killed in the settlement of Halamish were two men and a woman who were having dinner at the time. The army released footage showing a blood-covered kitchen floor. 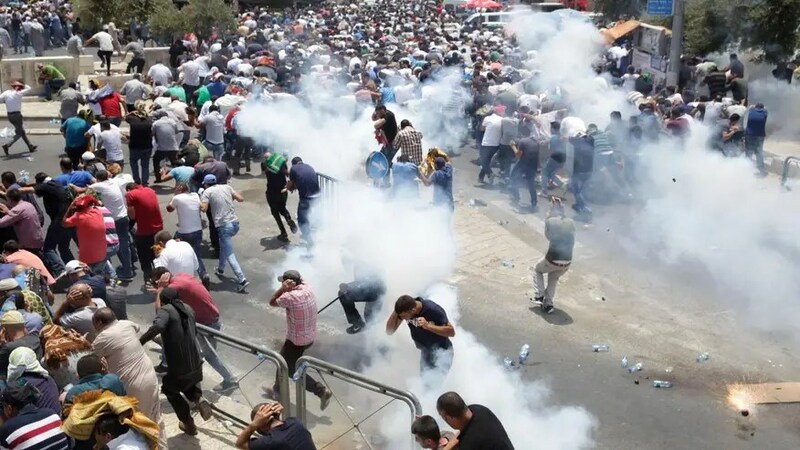 The bloodshed followed street clashes in Jerusalem left three Palestinians dead amid increasing tensions over the Holy Land’s most contested shrine. Israel TV’s Channel 10 said the assailant was in his late teens and had posted on Facebook that he was upset by the events at the shrine. Eli Bin, the head of Israel’s rescue service MDA, said an off-duty soldier next door heard screams, rushed to the home and shot the attacker through a window. Bin said the attacker was wounded and evacuated to hospital. 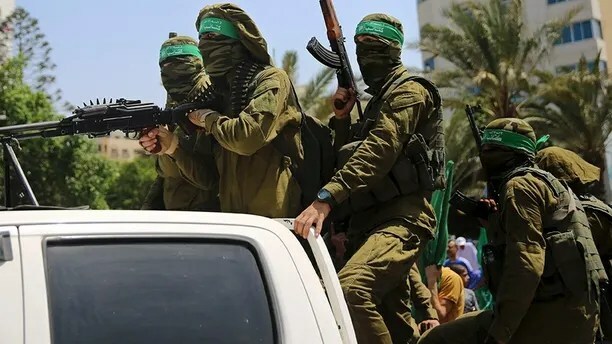 Masked militants from the Izzedine al-Qassam Brigades, a military wing of Hamas, ride vehicles during a protest against metal detectors Israel erected at the Al Aqsa Mosque compound in Jerusalem Friday. It was not immediately clear if this means long-standing security coordination between Israeli troops and Abbas’ forces will be halted. Israeli border police officers stand guard as Palestinians pass a checkpoint near Jerusalem’s Old City Friday. Disputes over the 37-acred walled hilltop platform in Jerusalem’s Old City have repeatedly triggered major confrontations in the past. 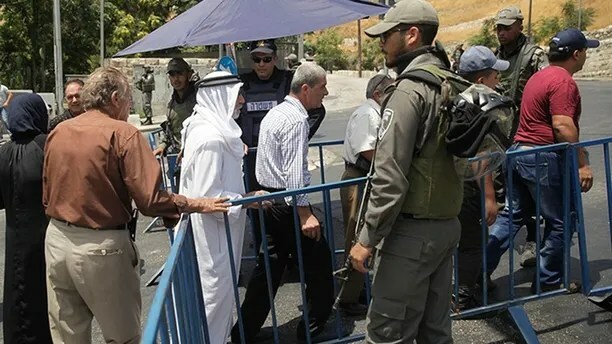 Muslim leaders portrayed the metal detectors as part of a purported Israeli campaign to expand its control over the shrine — a claim Israel denies. Muslim clerics urged worshippers to pray in the streets near the shrine, rather than submit to the new security procedures. In the end, thousands reached the Old City — a fraction of the typical Friday turnout of tens of thousands of worshippers. In recent years, religious opinion has shifted, and growing numbers of Jews are visiting the compound. This shift has stoked Muslim fears of a purported Israeli plan to expand Jewish control there. Israel has reiterated that it has no intention to change the status quo.